Introducing a new gantry crane product to the Mechanical Elements family of Do-It-Yourself Plans — as Free Plans in our launch celebration! Well, is it really FREE Plans? Yes. For the introduction, use the coupon code on the Beam Clamp Product Page to get the plans for FREE. The I-Beam Clamp is a simple product to solve a couple things for owners of a Gantry Crane. 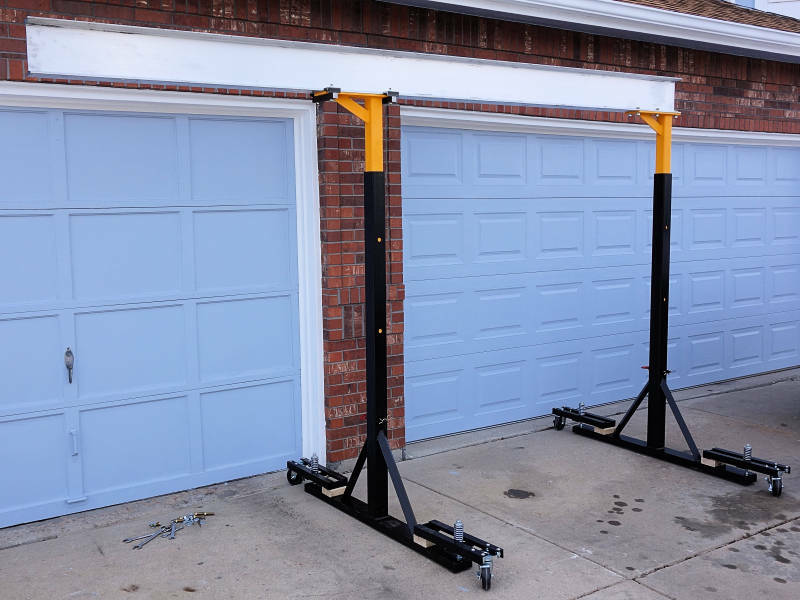 For a lot of Do-It-Yourself enthusiasts, the garage is not quite big enough for everything you have (or want), so equipment flexibility is a blessing. This new Beam Clamp magnifies versatility for our Line of Cranes. So, if have a Mechanical Elements crane, then check out this product. It may be the perfect enhancement. What is an “I-Beam Connector Clamp”? The main beam of a gantry crane attaches at each end to the legs or supporting elements. For many cranes, the main beam is an I-Beam which is known for its high strength to weight ratio. This image shows a main beam attached to the legs using bolts fastened through holes drilled in the I-Beam. This is, of course, a very sturdy attachment method, but it’s not very flexible. True, you can turn this leg around and bolt it with the top plate facing the opposite direction, but this only allows the leg adjustment of several inches. The NEW beam clamp, does not require holes drilled in the main crane beam. It is not as strong a connection, but for the right circumstances, it offers a unique way of attaching. This way, the main beam attaches in a flexible way, allowing the leg to position anywhere along the I-Beam. The I-Beam Connector Clamp is another fun Solution! from Mechanical Elements. The NEW clamp design is simple, and the implementation is easy as well. The intent is to clamp a flat plate on the I-Beam without drilling holes. This gives infinitely variable positioning to clamp the legs anywhere along the length of the beam. It also allows you to connect other items directly to the beam, securely, without drilling holes. 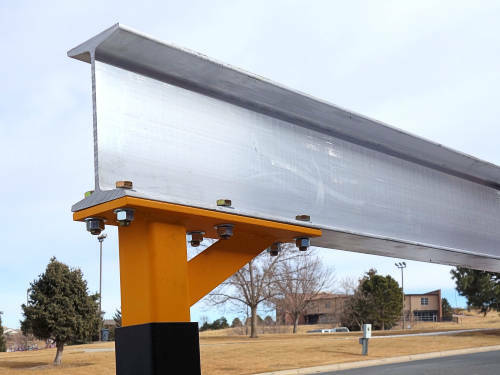 A frequent hiccup in connecting things to an I-Beam comes because the inside horizontal faces of the beam flanges are not parallel to the bottom face. When bolting, special washers can compensate for the angle. To conquer the problem for the Beam Clamp, parts are cut from C-Channel or from a section of I-Beam. In this way, the angles match perfectly. Here are a number of really cool applications for the new I-Beam Connector Clamps. Gantry Cranes made with plans from Mechanical Elements are big, and the legs are bolted on at the beam ends. Sometimes it’s nice to change the distance between the legs just for storage or for working around other equipment. With I-Beam Connector Clamps, legs are no longer constrained at the beam ends. The legs can easily move to any spot along the beam you want. On a personal note, I want a long beam for some things. However, in the normal setup, it doesn’t straddle well in my garage around the car and workbenches. With the beam clamps, I move one leg in to fit perfect over the car, then put the beam high so it’s ready to lift something off the truck. Just back the truck in, lift the goods, pull the truck out, and set the goods on a cart. No crane moving needed. Then, when I’m ready for other crane duties, it’s super easy to re-configure. Strength and length of the I-Beam determines a gantry crane capacity. When a beam is long, say 15′, the load capacity is much lower than if the beam was shorter, like 10′. With the I-Beam Connector Clamp the effective length of the top beam can be shortened as needed, thus increasing capacity. To illustrate this, we’ll use numbers from our Upsized Crane plans. If a 6″ steel I-Beam is at the top, at 16′ length the crane capacity is 2200#. Shortening the top beam to 12′ increases capacity to 3200#. If it is 10′, the capacity rises to 4000#. The I-Beam Connector Clamp makes all these configurations possible on the same single crane. Just mount the legs with proper spacing for the load. A gantry crane is a wonderful piece of equipment for so many applications. One drawback is the load must be between the 2 legs. Sometimes that’s not convenient, so we have to use an engine hoist (or other style crane) to reach. Hoists also have limitations, so in certain situations, these new Beam Clamps can change a gantry crane into a cantilever. It is very important to understand the limitations and potential crane safety issues, but it is possible. A word of CAUTION: The I-Beam Connector Clamp does not defy the laws of physics. If you configure a crane for a cantilevered beam, it REQUIRES counter-balance. If you try to lift something on the end of the beam, that is heavier than the other leg, the crane will tip. And, if you don’t pay attention, it will come crashing down doing lots of damage. Use the cantilever VERY carefully! Use it only with small loads, and ONLY with proper counter weights on the other end of the beam! Please don’t use this to earn the Darwin award. To hang something from an I-Beam in a non-permanent way, just fasten it to a plate, then clamp it to the beam. 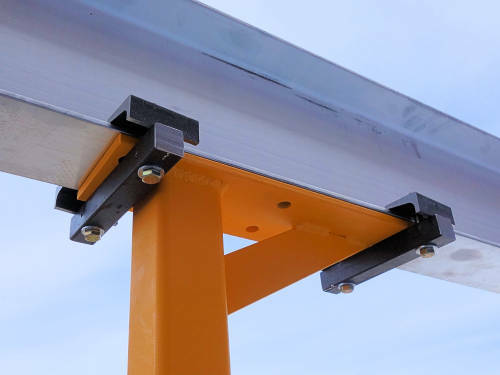 The I-Beam Connector Clamps will hold it in place, yet it is easy to move or removed the plate later. You can mount it under the beam, or for more security, clamp it on top of the beam. Or, (side note), if your needs are for light duty attachment or hanging items from a beam, then try this fun little I-Beam skyhook. It’s even simpler and easier to work with than the clamp. Please Note: We recommend using the I-Beam Clamps in pairs, so make the plate long enough for one on each side of the load. Load capacity is a function of the material, so live within the limitations of your particular clamp system. 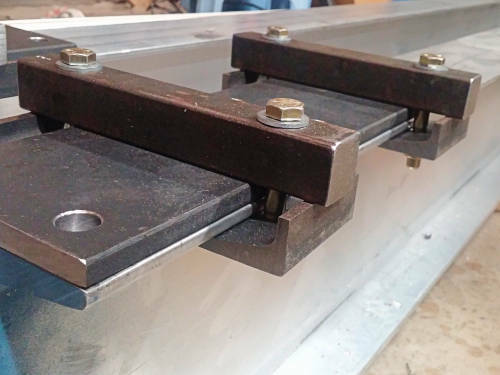 An I-Beam Connector Clamp makes a great trolley stop on your gantry crane. It will need a separate plate for the space, but when the clamps are not busy holding the crane leg, they can certainly limit motion of the load trolley. Or, make several so they are ready when you need them! As mentioned above, Free Plans are available for the Gantry Crane I-Beam Connector Clamps. The product page shows a price, but use the Coupon Code on that page to get plans for free. Free Plans are available for a limited introductory time, so get them now, while the getting is good! Enjoy the Beam Clamp Plans! — On ME — the Do-it-Yourself Mechanic. Save Big Buying DIY Project Nuts and Bolts Do It Yourself, And Use The Right Tools ! !